LONDON (Reuters) - Alastair Cook, as unflappable as ever, led from the front in the final innings of his record-breaking test career as England built a commanding 154-run lead over India at the Oval on Sunday. 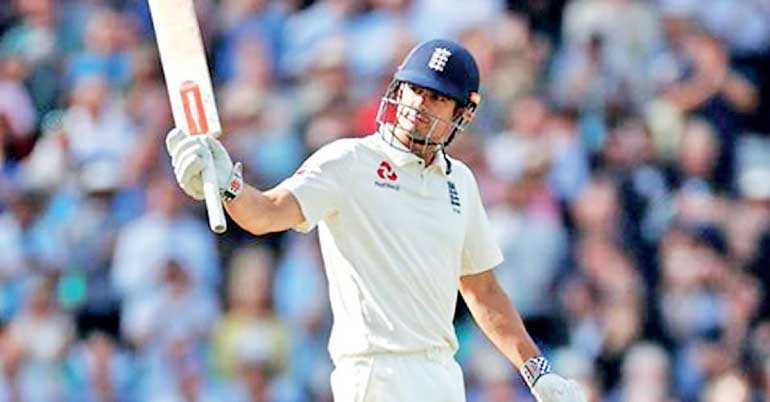 Probably the longest standing ovation heard at the south London ground welcomed Cook to the crease for his 291st and last test knock midway through the late-summer afternoon. England’s most prolific test run scorer began in nervy fashion as India battled hard to stay in contention on day three of the fifth and final match of the series. But by stumps he was set fair on 46 not out having ridden his luck at times in search of a second half century in his 161st test, having made a stubborn 71 on Friday. Thirty more runs on Monday would take him past Sri Lankan Kumar Sangakkara’s 12,400 and into fifth on the all-time list. With Joe Root looking fluent on 29 and England having eight wickets in hand Cook has every chance of signing off his magnificent international career with a victory. India had mounted a spirited fightback earlier to limit their first-innings deficit to a modest 40 thanks to a superb 86 by Ravindra Jadeja and a debut half century from Hanuma Vihari. Having begun the day in a hole on 174-6 in reply to England’s 332, India were eventually all out for 292.